News in overnight from Ann Avery at Northrop and Johnson that the 24.26m sailing yacht Y-Not has had a $100,000 cut in price. 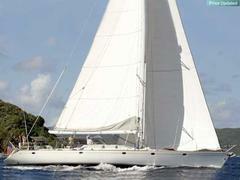 Y-Not was built to Bereau Veritas class by CIM in 1994 to a Farr design and refitted in 2006. This superyacht now has new paint, decks engines and sails. Combining both comfort and exciting sailing in a performance yacht, she sleeps six guests in a master and two twin cabins and boasts a successful charter record. Y-Not is now asking $1.195 million.